At CMR Entertainment, we offer Karaoke & Chroma Key-O-Key. Your guests can look through our catalogs, which consist of all genre of music and select a song from our large extensive karaoke library. They will then be introduced by the DJ to sing. Up to three microphones are available for duets and groups (more available upon request). The lyrics to the song will appear on a flat panel monitor and will highlight as the song progresses. Sit back, enjoy and cheer your guests on as they perform their favorite song. We will make you and your guests feel like stars! Chroma Key O-Key is karaoke with a fun twist. Your guests will be in their own live music video as they sing karaoke! Well add live video fx like the singer's name and the event. They will appear on a stage with pumping speakers and moving stage lights, beach or exotic location or a motion background of your choice. We'll also include a large flat screen or projection system so that your guests can watch the karaoke stars sing in the music video! There is also a cd or dvd option for this. We will record their audio singing performance on a custom printed cd or their video performance on dvd that they can take home. 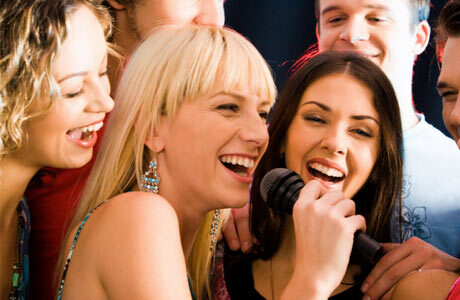 Karaoke can be the sole entertainment if you have a very energetic and singing crowd. Otherwise, we suggest combining it with a CMR Entertainment DJ and alternating between dancing and singing. CD. We can customize the labels and covers for your particular event (additional charges apply). They make for great party favors. Video screens and 50 inch plasmas with a live camera which enhance the experience. With a video screen or plasmas and live broadcast camera, your guests will be projected onto the screen as they sing their favorite songs. ﻿Click Here﻿ or call us at 609-209-3027 for more informaton.